Sunlight and water power are the renewable sources of energy. They will not run out like coal, oil and gas. They one day run out but not know I hope you can understand that. Energy from water power is very less expensive. Dams are being constructed at suitable locations in different parts of the world .Dams serve many purposes. They help to control floods by storing water. The water stored in dams is used for irrigation and also for generating electric energy without generating much environmental pollution. 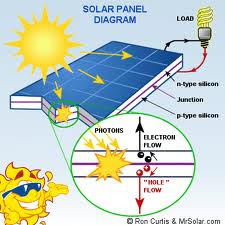 The energy we used from sunlight is called solar energy which is used directly or indirectly. Sunlight doesn't pollute the environment anyway the sunlight is the ultimate source of life on earth. We are dependent on the night sun for all our food and fuels. If we find a suitable method to use a fraction of solar energy reaching the earth then it would be enough to fulfill our requirements. Solar energy is used in solar cookers, solar distillation plants solar power plant. Etc. Here is the complete structure of the solar heater. A solar collector is made up of glass over blank metal plates. The plates absorb the sun's energy which heat a liquid flowing in the pipes at the back of the collector. The hot water can be used in solar cookers stock. Solar energy can also be converted directly into electricity by solar cells. A solar cell also called photo cell made up of silicon wafer. When sunlight falls on a solar cell, it converts the light into electrical energy. Solar cells are also used in calculators , watches and toys. Large numbers of solar cells are wired together to form solar panels. Solar panels can provide power to phone booths, light houses and scientific research center panels are also used to power satellites. Several other methods to trap sunrays are underway. If a scientist finds an efficient and inexpensive way to use so energy then the people would get clean, limitless energy as long as the sun continue to shine.